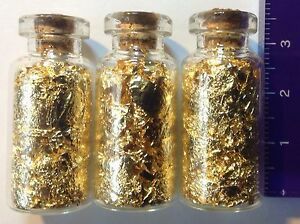 Details about 3 XL vials of Gold Flakes 35mm x 15mm glass bottles with cork. New Larger Size! HIGHLY RECOMMENDED SELLER! !ITEM SHIPPED FAST, PACKED WELL! !5 STARS!! Fantastic Ebay Seller! Been buying for years. NO problems. You Must buy Here!!! I like them there keepers !! !